Harry’s Tire was established in 1913 by Harry M. Chadwick and started as a retail tire store on Garden Street in Auburn, NY. 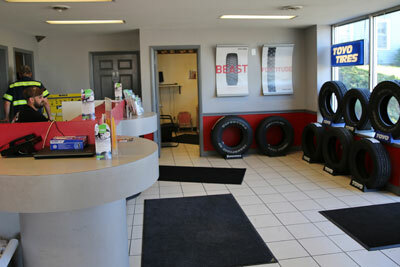 The service department specialized in brake services, front end alignment, exhaust system repairs, and tire retreading. With six fully-equipped tire service trucks, Harry’s Tire was able to make service calls all over Central New York and quickly became the largest independent tire retreading service in New York State. 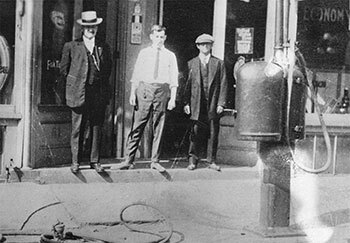 Harry’s founder, Harry Chadwick, in 1913 when he opened Harry’s Tire & Supply Co.
Harry’s Tire & Supply Co. sign lit up at night. 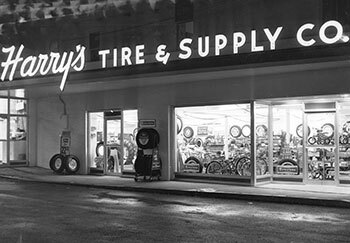 In 1965, Harry’s son, Norman Chadwick, bought Harry’s Tire & Supply Co. under Norman’s ownership. The company continued to focus on tire retreading, retail tires, and general automotive repair. In the 1970s, Harry’s Tire moved from Garden Street to York Street. 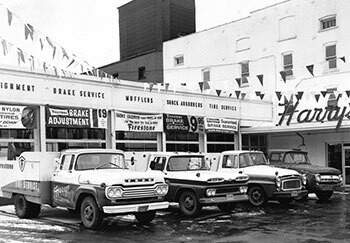 Attached to Crown Tire Co., Harry’s Tire no longer retreaded tires but evolved into a wholesale tire company. Norman owned Harry’s Tire until 1983 when it was sold to the Riester family. Harry’s Tire remained on York Street until 1998 when it moved to its current location on 142 Grant Avenue in Auburn, NY. 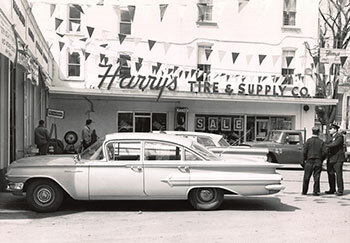 Harry’s Tire & Supply Co. in the 1960’s. Harry’s Tire & Supply Co. service trucks. Harry’s Tire continues to be a family-owned and operated tire and auto repair shop in Auburn, NY, and we care like only a family can. Our repair station features a nine bay garage, an air-conditioned waiting room, wireless internet, satellite television, and a newly remolded showroom. Our service specialists and technicians believe in making your experience affordable, understandable, and timely. At Harry’s Tire, we believe it is the service after the sale that truly counts! At Harry’s Tire, we do business the right way, offering a detailed explanation of your vehicle’s problems and honest, affordable prices. Our certified crew of vehicle technicians and service writers strive to provide the best customer service. Enjoy FREE WiFi while you wait. Harry’s Tire has one goal, and its 100% customer satisfaction. Because it’s the service after the sale that counts, we look forward to having you as a friend as well as a customer. All of our services are first-come-first-serve, and night drop is available. Appointments are not necessary, and there is no wait for servicing! We are vehicle maintenance experts, and we will provide the maintenance services needed to keep your car running smoothly. If you have any questions about our capabilities, contact us today!